Editor’s Note: One from the archives: Eric Soares wrote this essay illustrating the Tsunami Rangers’ approach to sea kayaking emphasizing ocean swimming as a key skill for sea kayakers. We’ll publish his thesis in five parts. This first part is the outline for Ocean Survival Swimming. Note that Eric refers to buoyancy compensators instead of PFDs. It was a long time ago but these ideas exemplify the Tsunami ethos and offer food for thought as well as suggestions for becoming a consummate extreme sea kayaker. Our next post in this series expands on Eric’s Four Prerequisites to Ocean Swimming. Stay tuned! I wholeheartedly agree with Eric’s Thesis and the Tsunami ethos. I can only imagine that Eric would have taken an enormous amount of flack from the kayak community and Paddle Sports Industry for this viewpoint. 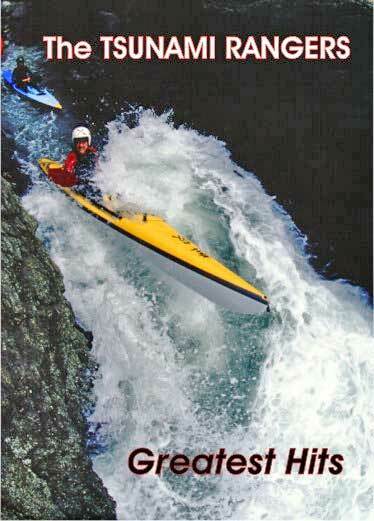 When I started paddling in the mid ’90s, the consensus was that maybe you feet would get wet while you launched. You didn’t really have to worry about getting wet. I’ve seen people wearing denim pants, a flannel shirt an Wellies to paddle the ocean. Kayaking as an “in-water-sport” would have been heretical. The idea that one might have to swim would be a deal breaker: Eskimo Roll, hypothermia?! I boogie boarded in a 4/3 O’ Neill full suit before I started kayaking, so at least I had a clue about immersion and swimming. To prepare for the classes I took with Eric and Jim, I wore my full battle kayaking gear and swam in surf and open water. A PFD and neoprene spray-skirt surely make swimming more difficult. It is essential to know this before heading out (going in). Lately I waveski in a full suit, hood, helmet, gloves and no PFD, I enjoy the freedom. I am confident that my skills and equipment are right for where I surf. I love the freedom of waveskis and surfskis; now I understand the logic of the Tsunami Kayak designs and being connected to the water. I’m looking forward the rest of the essays. Hi Rainer! Glad you enjoyed the post. I think you’ll really like reading the full thesis. It’s definitely a different approach to water safety. I started kayaking about the same time you did (in fact I believe I remember a class we were in together at Sniveler’s, isn’t that right?) 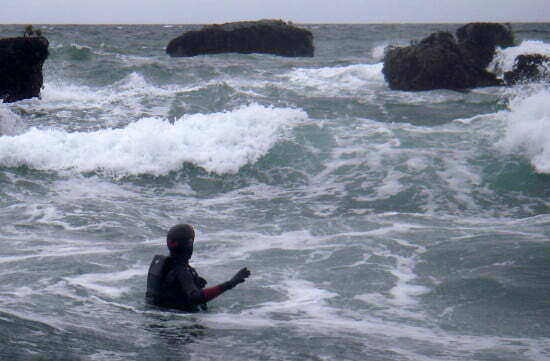 and as I’ve said before for me it’s not just a safety thing it’s the fun factor of ocean rock garden swimming. And how one doesn’t worry about flipping when one expects and even looks forward to getting wet. And no kidding about the PFD making it harder to swim (I’ve never tried swimming in a spray skirt but I can imagine the difficulties). I still have my doubts about wearing one but I do – most of the time. I only started wearing one when Eric did to protect himself from impact after his surgeries. His PFD had Kevlar plates that protected his chest and sides so it was ideal. Maybe one of these days I’ll reprint his “PFD – BFD” article. I think he probably got more flak for that than anything but it was hard to argue when you saw the kind of situations the Rangers were getting into. Thanks again for your comment! Eric was a trail-blazing pioneer and realist who refused to soft-peddle the hazards of sea kayaking. It’s great to hear from you, Moulton. Eric was such a good swimmer – it was a pleasure to watch him cruise around in creeks and rivers exploring the underwater environment. 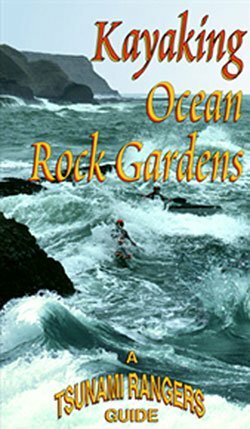 Partly because he started small as a boy in the riffles and rapids of our Northern California rivers he was fearless in ocean whitewater as well. I know most kayakers will probably think his emphasis on swimming skills is total overkill, but I believe people would have a lot more fun and be a lot more safe kayaking if they implemented even some of his ocean swimming regime. I don’t think you can overemphasize the usefulness of being able to swim comfortably in the same environment in which you paddle. Thank you for reading and commenting! As soon as I saw the term “survival swimming”, I immediately thought of my father, who taught me to swim the right way (underwater first, to avoid a fear of being underwater). “Survival swimming” was his mantra, and this attitude influenced me greatly as I eventually took up free diving, spearfishing, and finally kayaking. GREAT topic, Nancy, I can’t wait to see the other installments! Moulton, I just loved your Jonathan Swift quote, how true it is! That’s interesting that your dad taught you underwater swimming first, Tony. What a great idea! After all, when you fall in the water what happens? Right off, you’re IN the water, as in submerged. Once you can handle that your swimming skills can really flower and bear fruit. I’m glad you guys are happy with this topic. We’re going to take a quick break from it to talk about the Tsunami retreat next (another important topic!) but we’ll get right back to ocean survival swimming after that. Everyone should study something like this. I could’ve used it a couple years ago when I was kayaking Belize. Having the tide go crazy on you when your kayak is nowhere in sight is not a fun experience, let me tell you. Sandie, thanks for your comment. Yep, strong tides can wreak havoc with even the best swimmers. I’d be interested to hear your story if you’d like to share it with us. 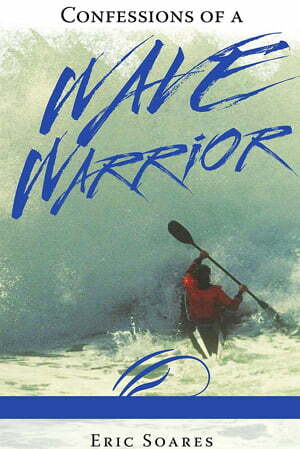 Kayaking, waveskiing, surfing, eventually you will be swimming. Your leash might break or you lose grip on your paddle leash. You should understand the currents where you are and how to get in safely. All water sports will involve swimming if something goes wrong and it will. You’re absolutely right, Ted. You WILL be swimming sooner or later if you participate in water sports. And why not, after all? The main thing is as you say to be prepared to swim and take that into account every time you go out.